Square dyes are in general more hydrophobic than Seta or SeTau dyes as they are more environment-sensitive. They typically exhibit lower quantum yields in aqueous environment and high quantum yields after binding to proteins or other biomolecules. Importantly the quantum yields and fluorescent lifetimes increase also upon covalent labeling to oligonucleotides, which makes them preferred labels also for oligos. 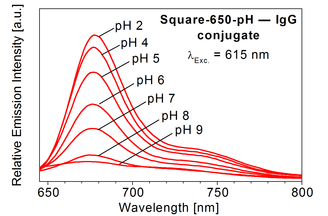 In general Square Dyes are most suitable for fluorescence lifetime based applications wherein a small molecular weight analyte labeled with a Square dye interacts with larger biomolecules (proteins or lipids). 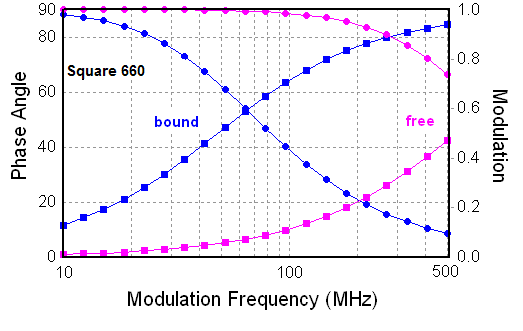 SETA BioMedicals offers several of these environment-sensitive FLT labels: all are excitable with a 633, 635 or 647 nm laser source (for more information see lifetime applications). 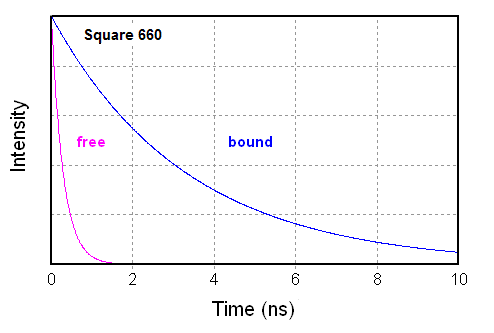 Square-660 before and after binding to BSA. Importantly Square dyes exhibit a large increase in quantum yields and lifetime upon binding to oligonucleotides. Square 660 was also successfully labeled to a single-stranded oligonucleotide and the hybridization with the complementary nucleotide lead to a change in its fluorescence lifetime from 3 ns to 1.8 ns that could be easily measured with lifetime-based micro-plate reader from TECAN (see application note below). pH-measurement in cells: Probes and labels such as Square-650-pH exhibit pKa’s in the physiologically pH range and are very useful to determine the intercellular pH in cells. For more information about these dyes we refer you to the specs sheet of Square-650-pH and the published literature . 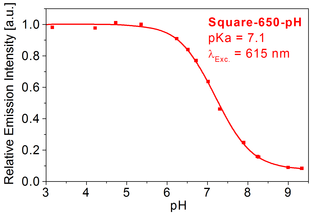 Measurement of endocytosis and internalization of surface labeled proteins with Square-650-pH. Importantly this is the only probe that enables measurement of endocytic events based on the measurement of fluorescence lifetime (FLIM) which is known to be more robust as compared to other parameters. Please make sure that you read the instructions on the specifications sheet to insure proper handling of the compound and labeled biomolecules. Square-680-NHS is suitable for labeling in hydrophobic environments.